You are on a Pilgrimage. Sometimes on that pilgrimage, you feel completely lost and very much alone. There are many ways to feel lost. You might have become restless and dissatisfied with the direction your career is taking. You may be longing for a better way to use your gifts. You might feel like you are living an inauthentic life. Or perhaps there’s just something missing and you can’t put your finger on what it is. Pathfinder is a guide that will help you navigate your way along this pilgrimage to your true path, where you can live authentically and wholeheartedly, using your gifts to serve the world in a meaningful way. It’s a creative journal specially made for people longing for authentic and wholehearted lives. For several years, through my workshops, writing and coaching, I’ve helped people find their paths. I’ve sat with them in the dark woods; reminded them of their courage, strength and giftedness; held a light on the path as they took the first scary step; encouraged them as they moved forward; and celebrated with them when they succeeded. After years of developing teaching material, creative exercises, and journal prompts for this purpose, I’ve brought it all together in the form of a creative journal. 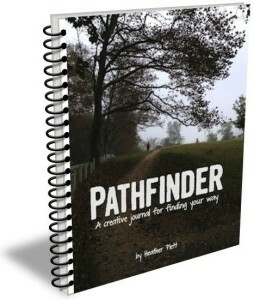 This resource, called Pathfinder: A creative journal for finding your way has 130+ pages of content, creative exercises, and space for journaling. The journal takes you from being lost in the woods (and learning to accept and learn from the darkness and discouragement), to exploring how your values, interests and gifts shape your unique path, and finally to a place where you’re ready to step onto the path. It will help you release what is no longer serving you, discover your own courage, find your companions on the journey, uncover your hidden gifts, recognize what song you are meant to sing, and finally understand what purpose you are meant to serve in the world. The content is rich and deeply thoughtful. Some of the inspirations for this journal include Theory U and Appreciative Inquiry, two methodologies that I use in group facilitation work for helping organizations and communities move through change. Both of these have been used around the world in significant change processes to help people release what is no longer serving them, focus on what is working and what wants to emerge, and move through change with grace and hopefulness. They are as helpful for personal exploration as they are for group work. What makes this journal unique is that it doesn’t simply help you create goals and then move toward them, it acknowledges the value of being lost first. In the first section of the journal, you’ll explore what it means to tear up the map and make space for the path that hasn’t emerged yet. You’ll learn to navigate in the dark, because the darkness has lessons to teach us before we step back into the light. The journal prompts and creative exercises are engaging and thought-provoking. I am confident that this is a helpful resource and I want to get it into the hands of as many people as possible, and so I have turned it into a simple hardcopy journal or downloadable pdf for a much lower price than you’d pay for equivalent coaching or workshops. “Marcus Aurelius said, ‘Look well into thyself; there is a source of strength which will always spring up if thou wilt always look there.’ Heather Plett’s Pathfinder journal is a full-fledged traveller’s guide to that self. The stories, journal prompts, irresistible invitations and space to create will guide your hand, urge you along and shed light on a life path that can loom dark, overgrown, rocky and too often completely indiscernible. It is my hope that you will find your path and that you will learn to live an authentic, courageous, wholehearted life. For only $19.87 for the hard copy journal (plus shipping & handling) or $11.92 for the downloadable pdf version, you’ll get access to a lot of the wisdom I have shared with clients who have paid hundreds of dollars for workshops, retreats, and coaching sessions. Want to use Pathfinder for group work? Following requests from several people who want to use Pathfinder for coaching circles, retreats, women’s groups, classrooms, etc., I’ve created a group guide that is now available as a free downloadable pdf. You’ll get 44 pages of content that give you guidance on how to host your circle, ideas for creative processes to include in your group gatherings, suggested poems to read to support each chapter, and questions to ask the group in support of their ongoing journal work. Download your free 44 page Pathfinder Circle group guide here. If you want to order multiple copies of Pathfinder for your group, you have a couple of choices: pay $55 for the rights to distribute/print up to 20 copies, or contact me with a request for the hard copy version and I’ll send you the shipping cost estimate. Contact me and I will send you an invoice and shipping costs.